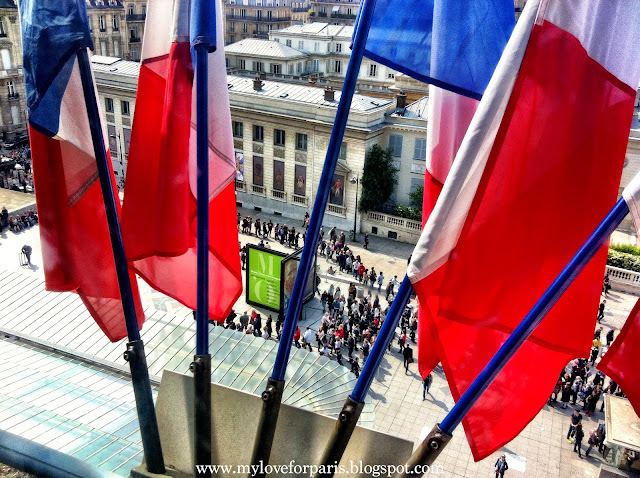 My Love for Paris: Why Musée d'Orsay is so "easy to do"
Musée d'Orsay is one of my favourite Parisian museums for a couple of reasons. For one, it's much smaller and more manageable than the Louvre (but really, to be honest, it's pretty easy for any museum to be smaller than the Louvre). I love the Louvre and all of its glory, but what I find often happens is that at the beginning of any museum visit, I'm all there - channeling my inner geeky school kid. I'm in awe of my surroundings and I'm super attentive. I want to absorb every tiny detail and read all the information on those little plaques, in French and in English. If only I had a clip board and a pen to take down some notes..! But this really only lasts for about.. you know, an hour. Needless to say, the Louvre takes well over 3 hours to properly "do". 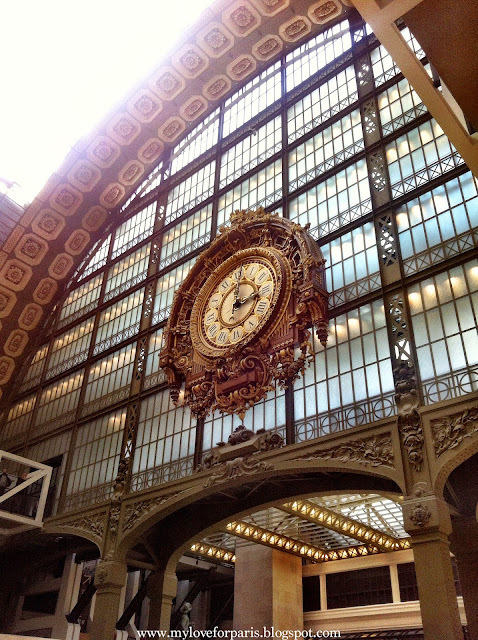 Whereas Musée d'Orsay is easily done under 3 hours, break time included! 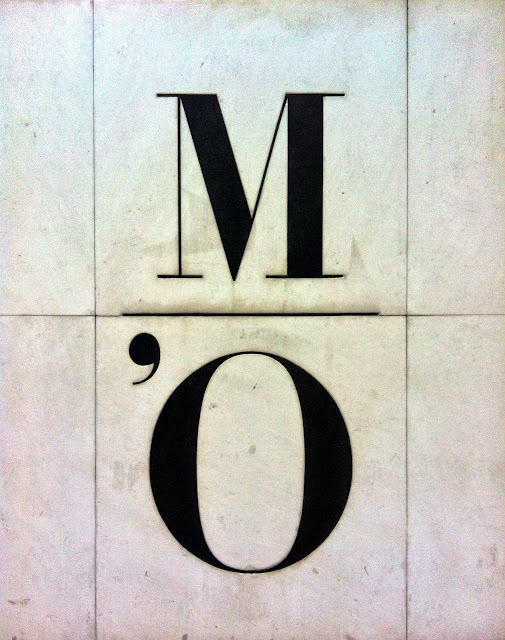 Another reason why I like Musée d'Orsay is that it used to be an old train station - Gare d'Orsay. 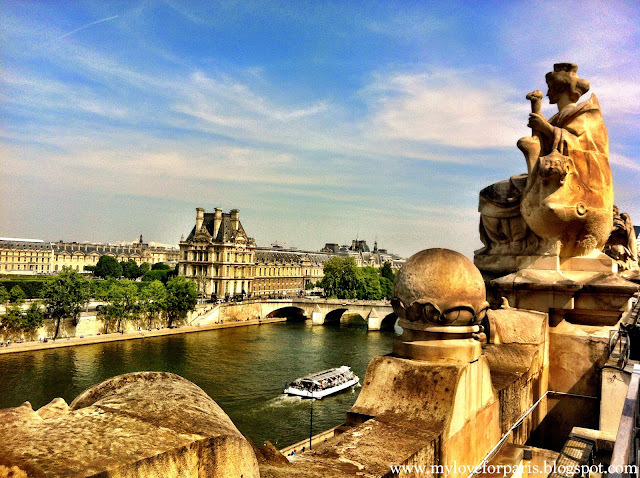 It was built just before 1900 and being on the left bank of the Seine, offers gorgeous views of Paris that you can catch on your "break" from the museum. Apparently Musée d'Orsay was meant for demolition once it became no longer suitable for housing longer trains (due to its short platforms). Luckily it escaped demolition, was used for a few other purposes including a mail centre (I know, that's where Frenchies used to sort mail..!?) and a movie set and is now a uniquely beautiful home to one of my favourite Parisian museums. Temporary and permanent collections of French artwork, paintings, sculptures, furniture and photography are both available to visit included in the 11€ (full price) / 8.50€ (concession) ticket. 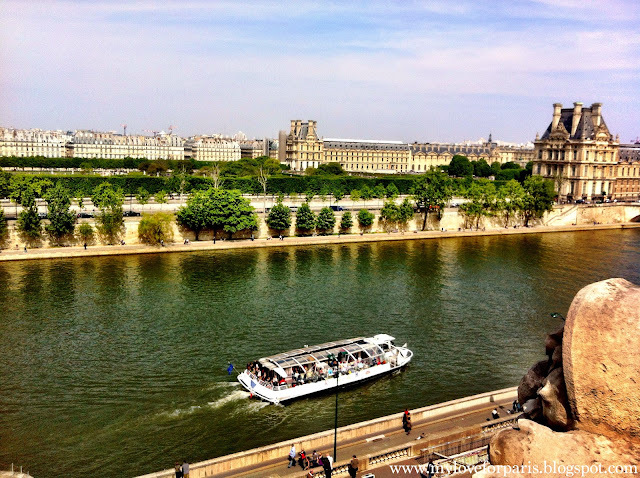 Better yet, come spend a lazy Sunday afternoon at Musée d'Orsay on the first Sunday of the month when it is FREE for all! 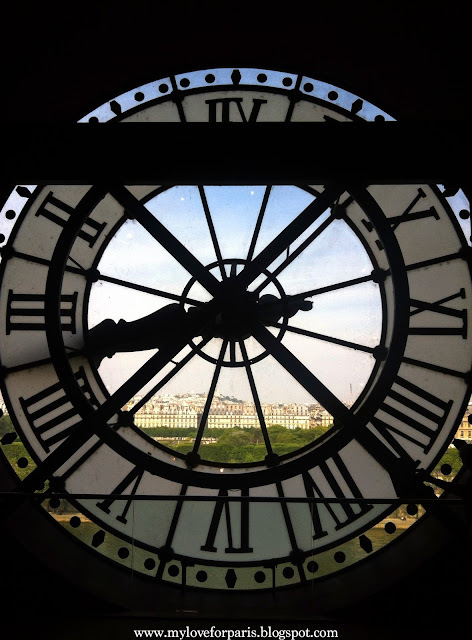 As mentioned before, the great thing about Musée d'Orsay is that once you feel you are a little "museumed-out", you can have a break and head up to the fifth floor to see this beautiful clock and a view of Paris like no other. 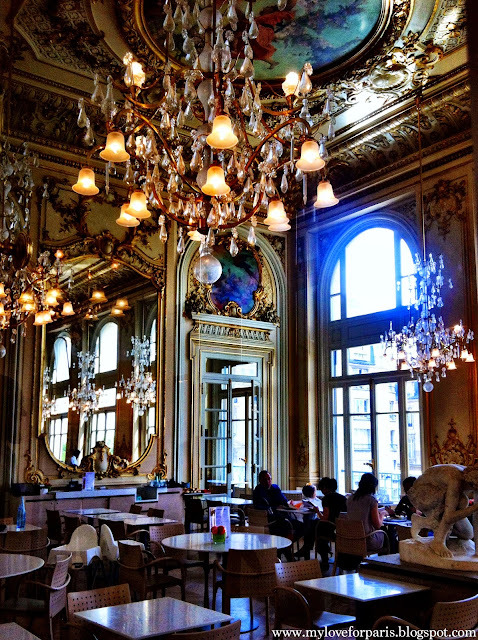 There's also a café where you can have a seat before wandering out onto the balcony for some fresh air and some more breathtaking views of Parisian Haussmann era architecture. After this reviving break, make sure you check out the Impressionists collection normally located on the top floor as it is meant to be one of the largest collections in the world. Monet, Renoir, Cézanne etc - you will leave feeling besotted with their masterpieces after being swept away into this romantic universe. Suddenly what you see with your own eyes does not seem to measure up to what those artists saw before theirs. Even if Impressionism isn't your thing, you will leave with a real appreciation of this era's style and artistic interpretation. Another place I would recommend to see is the.. BALLROOM! I wasn't allowed to take photos there, but I can assure you - it was a wonderful experience. I entered the room, and was instantly transported to the time of extravagantly elegant ball gowns and dainty graceful dancing. Huge mirrors lined the walls and I was able to catch a glimpse of my reflection against the backdrop of the ballroom. Except my reflection didn't reflect real time, my reflection was of another me from another time period. Nhan in her parallel universe twirling around in her full length ball gown. Frenchie just stood there patiently while I zoned out for a bit, getting to know how well my imaginary 18th century ball gown could spin and fill out. To calm yourself down and snap back to reality, drop by the restaurant which is just around the corner from the Ballroom for a little snack or a hot/cold drink. It's a cross between the past and the present I feel. Close your eyes to imagine yourself in the former. Open your eyes to order in the latter. Prices aren't too bad considering the ambience you get to dine in. You can order a light salad for around the 15€ mark and have a drink and some cake for under 10€. For more details like opening hours (do not go on a Monday as it's closed!) and what collections are on, click here. I was able to catch the Van Gogh exhibition last time I was there, which was well worth the visit! Works of art were on loan from different museums around the world so that this exhibition could be put together. There are also a few partner tickets you can purchase which will provide discounts into Opera Garnier, Musée Rodin, Musée de l'Orangerie, Gustave Moreau National Museum offering a considerable saving if you plan on doing more than one museum so check out the official website if your visit doesn't happen to fall on the first Sunday of the month! 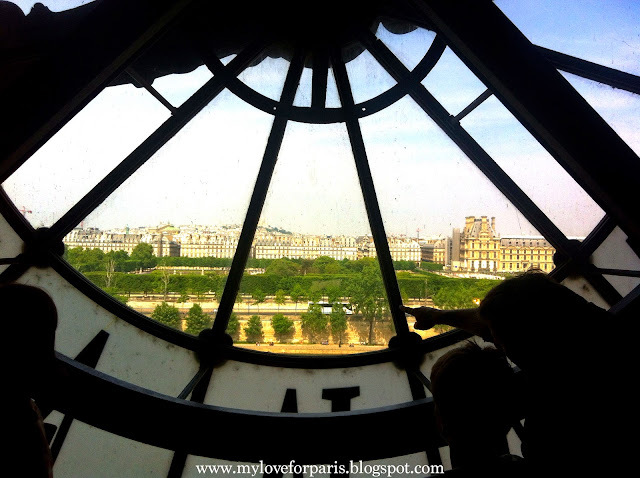 Enjoy Musée d'Orsay, it's very "easy to do" for anyone, you don't need to be a museum buff. Balcony views, the unique train station factor as well as various points to stop, grab a bite or a drink to recharge make this museum definitely one to pop onto your list. What a beautiful article Nhan! I always follow your fantastic posts and very enjoy reading them. Thank you for sharing your experiences, Nhan! All the very best to you!